As is true for many others, Christmas is an important family time for us. This will be the fifth Christmas since we moved to the prairies, far away from friends and family. Our kids and other family are spread around, but none of them live near us. So every year we have travelled a long way to spend Christmas with some of the family, or they have travelled to our city to spend Christmas with us. Last year we spent Christmas with Rob's daughter and family in the north, and had a wonderful time seeing our two young grandchildren there experience Christmas. We also managed to fit in a visit with my extended family in the north and saw some dear friends. 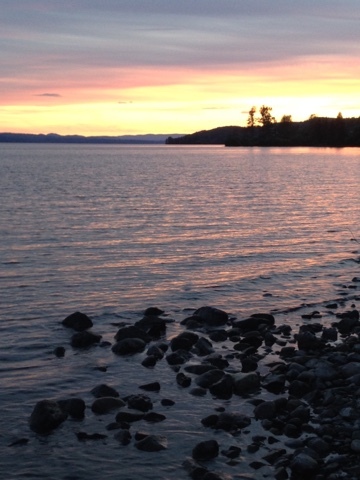 This year, my daughter invited us to spend Christmas with her family on the southwest coast of BC. I was thrilled! My two grandsons are four years old and one and a half years old -- perfect ages to experience the magic of Christmas. We rented a little house in a resort community not far from my daughter's place and spent two days driving here though nasty snowstorms. Horrible blizzards on the way. We brought both pets along, a dog (Kate) and a cat (Oliver). We have travelled with the dog before, mostly in the truck and camper, but bringing Oliver has been a bit of an experiment. So far it has worked out really well. They are both happy to have come along on the trip, and have settled in well and behaved themselves. I guess they know that the alternative would have been to stay in a kennel, not their favourite place. Oliver making himself at home. I am really looking forward to Christmas, as not only will I get to spend time with my daughter, son-in-law, and grandsons, but also my son is living here and attending university at present, and my middle daughter who lives in a nearby city will come stay with us for a few days at Christmas. It will be the first time in a few years that I will spend Christmas with all three of my (now adult) children, AND the first time ever to spend Christmas with both of my grandsons. Rob's two kids and my three all have been adults for quite some time. They have busy lives and we are so proud of all of them. Of course, those busy lives and my career have meant that we have all ended up living in different places, for the most part far away from each other. We don't have the chance to see each other on a week-to-week basis, but usually just for short, intense visits. I love seeing my kids and sometimes feel sorry for myself that I don't have much time with them. One never really stops being a parent. I remember when my first a child, my oldest daughter was born. Those wise eyes, rosebud lips, chubby cheeks, and black hair -- it was love at first sight! Although I had little experience with babies and had never played with dolls, suddenly I was the proudest, most possessive parent on earth. When my second daughter was born, it was love all over again. She was the most cuddly, happy baby ever, with thick blond hair that stood up straight and an old soul's blue eyes. And then my dear son was born, calm, long, and skinny (in contrast to my first two chubby babes). He was very observant and content. He was a boy who bum-scooted around the kitchen, and figured out how to open the cupboard and help himself to cheerios (breakfast cereal). He was a kindhearted boy and now is a fair minded, kindhearted man. When I look at my adult children today, I see their day-to-day lives and dilemmas superimposed over my memories of them at each developmental stage of their early lives. That is an annoying thing about parents -- they persist in thinking about the past. I know that when I was a young adult, and even a middle-aged adult, my attention was focused on the present and the future. It is only now as I am on the threshold of my senior years that I have become more nostalgic and interested in the past. 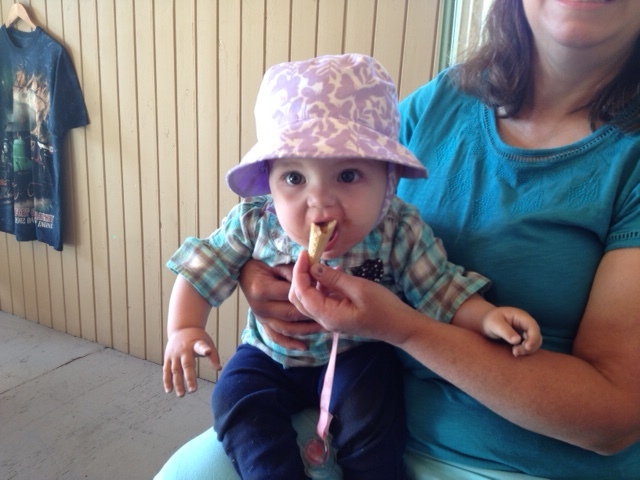 Becoming a grandma is reminiscent of that first experience of becoming a mom. Those tiny little humans are born into the world with their whole futures ahead of them. I love them with the same intense passion that I loved my own babies. I am very lucky, because I get to be grandma to my children's children, and also to Rob's children's children. Yet being a grandma is different than being a mom. I am not the parent, and it is not up to me to make parenting decisions. I am only around from time to time, not every day, and each visit is a chance to build my relationship with my grandchildren a little more. At the same time I try to offer whatever help I can to their parents who are busy and enmeshed in complicated lives. Sometimes it is not an easy balance to be present, to spend time with the grandchildren, to help out, and to also spend some one-to-one time with my adult kids, without being intrusive, neglectful of my spouse's needs, or ignoring my own needs and boundaries. I sure have noticed that I no longer have the same energy level that I used to -- being with small children can be exhausting. A walk on the beach with Kate. So, we feel very fortunate to be staying for a whole month and to have a rented house during this Christmas visit. We will be able to experience some great family time, and stretch it out over a period of weeks, rather than trying to cram it all into one short intense period. It also gives Rob and me some quiet time to spend just with each other, walking on the beach, sitting in front of the fire, or going out for a romantic dinner. It gives my daughter's family some breathing space, without feeling the pressure of having guests in their home for an extended period. And, as it is a vacation for us, we would like to make a few little excursions while we are here, visit some friends, and possibly go skiing. But, the highlight will be spending Christmas with my kids and grand-kids! In my last post, I mentioned that I was busy writing a novel. I participated in National Novel Writing Month (NaNoWriMo) this November. The objective of NaNoWriMo is to write a 50,000 word novel in one month. Sadly, I must report that I was not successful at completing 50,000 words of my novel. However, I did mange to write 35,493 words. That adds up to 134 pages, double-spaced, or ten and a half chapters. I have started on Part Two of the three-part novel. I think that the first draft was about one third complete by the end of November. I had great fun starting a new novel, and am continuing to chip away at it now that November is over. The novel is titled "The Age of Grandchildren" (working title). At the request of readers, I am posting a brief synopsis, as well as an excerpt from one of the early chapters. Becca and Honor live with a collective of women in an underground shelter in the wreckage of a former university. They were born in the shelter and know no other life. Their mothers and grandmothers formed the collective as a survival strategy when North American society disintegrated in the early 21st century. Becca and Honor are just reaching womanhood, and their collective is facing a crisis as the group has nearly used up the supplies stored two decades ago. Systems in the shelter are beginning to fail, and memories of life on the outside are being lost as the older members of the group become elderly and die. The lives of the women are about to change, and both Becca and Honor have important roles to play in trying to ensure the survival of the members of their little community. The intense red of the sunset had faded and the sky was darkening into night. Her anxiety growing, Becca peered out into the distance toward Outpost 1.4. Where was Honor? It was becoming too dark, and Pattern 1.4 through the ruins of the shattered buildings was one of the most difficult to run. Was that her? Yes, Honor was coming, bobbing and weaving as she ran the pattern through the rubble. Becca tracked her approach. Hop, hop, hop, zigzag to the left, right, two feet, hop, hop, leap, and she’s safe on the platform! Honor shrugged her knapsack off. The two young women turned to descend into the shelter, but not before Becca noticed her friend cast a surreptitious last look out over the desolation. Once inside, Becca sealed the door electronically and set the mechanical deadbolt. Honor pushed the package she carried through a slot for the Mothers. The two women stripped off their contaminated sweat suits, put them into a covered bucket, and stepped into the anteroom shower. For one glorious minute the lukewarm water fell, and Becca concentrated on rinsing those parts that had been exposed – her hands, her face, and today, the front of her hair. When the trickle of water stopped, they completed their bathing the usual way, with soap, a cloth, and a basin of water. Becca mused about her good fortune in having been chosen as a watcher two months ago. She had discovered that she loved the experience of being on the outside at twilight each duty day, despite the risks. Although her first shower had been the best, she continued to look forward to that minute as a highlight of each duty day. “Hey, Honor!” Honor was staring fixedly at her towel, and she startled when Becca spoke. “Honor, tell us, what do you feel out there without us, solitary? They walked naked through the inner door, sealed it, and donned robes. Becca trailed behind Honor barefoot on the cold polished tiles, fastening the ties of her robe. What was wrong with asking Honor how she felt out there? That seemed like an important question for a novice watcher to ask a runner. Becca had been trained that all members of the collective must be attuned to emotional states, and to be transparent in sharing the inner consciousness. Becca reflected that although Honor had been generous in guiding Becca on the correct performance of the watching duty, her friend often seemed reticent about expressing internal states, especially at group sharings. Many would consider that a mark against her, but Honor had proven herself extremely capable at learning the patterns. She was able to run all eight of the main patterns consistently and flawlessly, and she was studying the difficult second level patterns now. Honor had been awarded her position as a runner very young; in fact, she was only two years older than Becca but already had been running for more than a year. Ah, the Mothers were ready to see them now. It was Mother Beulah and, oh no, Mother Mary. Becca groaned inwardly. “Honor, Becca.” The Mothers came forward and embraced them. Mother Beulah was thin as a wisp with a cap of steel grey hair, white at the temples. She wore a silver and emerald nose stud, and multiple earrings on each ear. Mother Mary, in contrast, was a large, square-jawed woman, who pushed back the sleeves of her robe impatiently and strode forward, glowering. Her hug felt like a wrestling hold. “You are late tonight,” said Mother Beulah. Her tone was mild, but as she gazed into Becca’s eyes before turning to Honor, Becca felt Mother Beulah’s bright blue eyes send a shock down her spine. She imagined that Honor must feel something similar, although Honor’s facial expression remained unchanged. “Yes, the transfer was not prompt,” Honor explained. “You know the rule. Never wait by the fence on the outside rim. If the transfer is not ready . . . ?” Mother Beulah said, raising her eyebrows at Honor. Her high-pitched nasal voice grated on Becca’s ears. “But the transfer was concluded successfully,” Honor mumbled, looking at Mother Mary’s feet. “Yes,” Mother Beulah smiled, and her gold tooth glinted. “Concentrate on the pattern, and follow the rules. Understood, Mother Mary. This one begs pardon.” Honor’s face was as smooth as a plaster mask. She said nothing about turning her ankle while running the pattern. Becca opened her mouth to report the misstep in the run. According to regulations such discrepancies must be recorded, and it was her responsibility as a watcher to report it to the Mothers. Mother Mary swiveled to face her, her little eyes invisible behind the glare of her eyeglasses, her jaw jutting up. The words died in Becca’s throat. She closed her mouth and swallowed. “Peace -- peace for the collective,” she stammered. The Mothers nodded, Beulah closing her heavy eyelids, and Mary with a jerk of the chin. Both Mothers stepped forward and embraced them again. “Peace for the collective,” the two Mothers intoned. “And peace for the Mothers and Grandmothers,” Becca and Honor said in unison as they took their leave. Anyways, it is greatly enjoyable inventing a world and setting some characters loose in it. I have been amazed that as long as I can get myself seated in front of the keyboard, the story just spools out onto the screen. I guess that is the whole point of National Novel Writing Month -- to give ourselves an excuse to sit down and write. Is there such a thing as a writer doing too much writing? If such a thing is possible, that is the situation I am in at present. Then there is this blog. Unlike some bloggers, I have not set myself the expectation of generating two posts a week, or even one post a week. I just kind of write a post when something interesting comes to mind and I feel like sharing it. That said, it is two weeks since I have last posted here. I have just been way too busy writing, somewhere else. It is November, National Novel Writing Month, and I am writing a novel! During NaNoWriMo, millions of people around the world commit to write a 50,000 word novel during the month of November. In order to accomplish this goal, one has to write an average of 1,667 words a day on the novel. I am already behind on the average, as I have only managed to to squeeze out an average of a little over 1,300 words a day. I am having immense fun writing this novel. It is a speculative fiction novel about a dystopian future with a little bit of a coming of age story, some romance, and some social critique thrown in. Speculative fiction/science fiction is a new genre for me. In my previous two attempts at writing a novel, both were of the literary/mainstream fiction genre. One of those two novels, Memories of a White Girl, was written during previous NaNoWriMos over three consecutive Novembers, and it is now a mammoth 125,000 page first draft, still awaiting the revision process. The first draft of the other novel, still lacking a title, is about 3/4 finished, and I began that one years ago, before I had ever heard of NaNoWriMo. This year during Nano, I have decided to turn a deaf ear to the advice commonly given to participants. Participants are encouraged to just write down whatever flows through their mind, not stopping to edit or rethink it. The idea is that by not giving in to the internal editor, who can be rather harsh and critical, the wells of creativity will flow. As well, people who struggle to find ideas and who procrastinate for that reason will overcome their inhibitions because they tell themselves that they just have to write something, anything, and it doesn't have to be good. Well, I don't write that way. I am the kind of writer who never lacks for ideas, for one thing. When I write, I like to craft each sentence and paragraph perfectly. (Aha! The perfectionist rears its ugly head!) Each time I sit down to write, I read over the recent section that I have written and carefully revise and edit it, changing word choices, adding more vivid description, and refining the dialogue. Then I go onto the next part in a fairly linear way. With that approach to writing, when the first draft is done, it is a much more polished first draft that requires less revision than if I had just thrown any old words onto the page. I love to craft a story, and I am not at all fond of revising, especially if the manuscript is a big mess. I really think that my first NaNoWriMo novel would have gotten beyond a first draft if I have written it my way rather than following Nano advice. I am nearing the end of the fourth chapter of the novel and have introduced the central characters and portrayed their society as it functions in some future time. Now I am beginning to introduce some big troubles for the main character and her significant other. If you are involved in NaNoWriMo, you can read a synopsis and brief excerpt of my novel in progress under my profile. My pen name is AnnaHarvey. So, one thing that I have discovered while being on leave is that I am pretty busy. My secret dread about retirement is that I will find myself sitting around twiddling my thumbs and contemplating the awful nothingness of being. Or some such thing. Rob is fond of saying that he has never been as busy as he has been since retiring. I always heard that statement with a certain degree of skepticism (I mean, what could be busier than 14 hour work days?). But if my leave period is any indication of what retirement will be like, I'm discovering that Rob just might be right. Phew! Saved from contemplating my navel! So as well as all of the writing that I have described, I have been fitting in daily exercise most days - yoga, a walk, or some cycling. 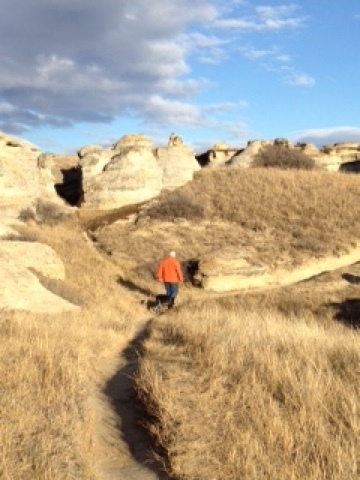 Last weekend, we spent a lovely afternoon riding mountain bike trails in the river valley. On Sunday, we made an all-day excursion to some hoodoo formations, and hiked through them and viewed petroglyphs that are said to have been created in the late 1800's. I am working on a large landscape painting, and also on preparing two of my plein air paintings for an exhibition coming up in early December. I have arranged to rent a house on Vancouver Island for a month at Christmas time. Christmas with our kids and grandchildren - yay! I have been to a concert, lunching with a friend, and on the phone to far-away friends and family. And I baked cookies, which our waistlines have not needed, especially with all of the Halloween candy around that also needed to be eaten up. I have to add one brief whine. The Blogger app for my iPad is broken, and there is no update in sight. My favourite way to write on my blog is on my iPad - it makes it so easy to access my photos, and it can be done while lying on the couch. The Blogger website, unfortunately, is a nightmare to use on the iPad. So, I am apologizing in advance for any typos in my posts. Now, my only way to write on Blogger and access adequate editing capabilities is to go and fire up the laptop. I wish Google and Apple would just get over their rivalry and produce some decent Blogger functionality for the iPad. So if anyone knows of a great Blogger app that works well on an iPad, please let me know. 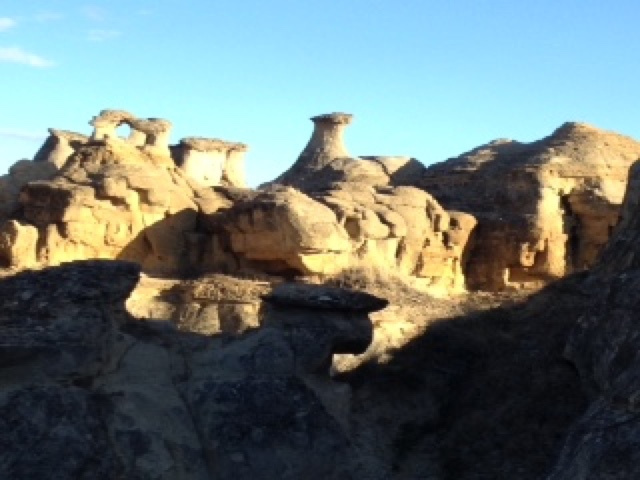 The photos in this post are of the hoodoos that we visited. Life is good. I want to begin by apologizing for not posting very frequently lately. I am in the middle of a big work-related writing project, so that has left me less time for writing blog posts. "Wait a minute!" you say. "You are on leave, so what's with doing a work project?" Yes, I am on leave. However, when I arranged the leave, I committed to doing some projects. They are projects of my own choice, with a relaxed timeline. I am greatly enjoying my current project, and rarely spend more than half a day on it. (By that I mean five or six hours. Yes, I do have a workaholic's definition of the length of a workday.) So after staring at books and the computer screen for that many hours, I am less inclined to write a post. However, tonight I have been inspired to write something on health and exercise by a blog that I have been reading. That blog is Retired but Certainly not Retiring, written by John, and here is his recent blog post on the topic. A goal John set for himself when he recently retired was to begin living a more healthy lifestyle, and in particular to lose some weight. He has written some rather hilarious posts on the topic, but the goal is serious. John's discussion reminded me of a series of posts I wrote a few years ago on the theme of heart healthy choices. My focus on this came about because I went to the doctor for a physical exam, and she informed me that my LDL cholesterol (the bad type) was borderline high. She encouraged me to start a low cholesterol diet. The handout she gave me had none of my favourite foods on it! So I promptly ignored it. But I did set about taking a look at my eating and other health habits. I talk about this in Heart Healthy Habits. After taking stock of my healthy attitudes and behaviours, such as eating lots of fruits and vegetables every day, I took a hard look at my not so healthy behaviours. Oops! So I set about changing some of those unhealthy habits. My first action was to research and read about lifestyles that support heart health. I looked at trustworthy health and medical websites, and also went right to the source and read some research articles in journals. So that gave me some background on what to look for in my own health-related behaviours. As well, from my knowledge about making behavioural changes, I know that one of the first steps is to notice and track the habits. Habits are routine behaviours that usually fly under the radar. They are actions that are so routinized that we may fail to recognize that we are doing them, or to what extent. We humans also are amazingly good at minimizing the impact of or excusing our own undesirable behaviours. This is reasoning like, "food eaten while standing at the fridge doesn't count," or, "I'll go for a long bike ride tomorrow to make up for having spent the whole day on the couch today." 1. Defining the overall objective in terms of a vague general outcome: "I want to exercise more." It is more effective to define the goal in a specific, concrete way: "I will exercise at least 150 minutes a week, and this will include at least 5 days of exercising, at a minimum of 20 minutes each day." 2. Trying to make a big change all at once: "I will drink 8 glasses of water a day." Well, if you currently don't drink any water, but only coffee, tea and beer, this would be a very big change to make. You would be more likely to be successful if you break it down into little steps: "I will drink one eight ounce glass of water just before I open my first beer of the day." Once you have successfully achieved this goal to the point that it is a habit, then you can incrementally increase the aim to two glasses of water a day: "I will drink an 8 oz. glass of water when I brush my teeth in the morning." And so forth. Little changes are less daunting and much easier to make and sustain. 3. Trying to change several habits at once: "I'll only drink water from now on, and I'll eliminate all wheat from my diet." Well, not only does this objective try to add a water-drinking habit, but it also aims to eliminate a coffee habit, a tea habit, and a beer habit at the same time. And that doesn't include all the complications of the wheat part. Some very determined people might be able to accomplish big complicated goals like this, but more often than not, my guess is that they don't sustain them. 5. Not keeping focused on the goal long enough to make the new behaviour habitual. It takes 3-6 weeks to establish a new habit or to eliminate an old one. For me, I set the bar at 3 consecutive weeks of success with each goal before I stopped formally tracking it. So, four years later, looking back at the lifestyle goals I set for heart healthy living, I am happy to report that I have maintained 7 of the 10 new habits with no effort whatsoever. The new habits have truly become part of my everyday living. Although I have not been following such a formal lifestyle plan recently, I have incorporated the 150 minutes of exercise a week into my life consistently since I have been on leave (which is possible now that my foot is rehabilitated). On Saturdays and Sundays, Rob and I make a point of getting out for longer bike rides or hikes. Today we cycled 12 kilometers. Typically we cycle 8-16 km. (5-10 miles) or hike/walk 5-10 km. each weekend day. I have been tracking my exercise activities on an app on my phone. It tells me I have walked or cycled 108 km. so far in October. Once the snow falls, we will get out the cross country skis and ski around the golf course or the park. Or we will travel to the mountains for downhill skiing. During the weekdays, I walk most evenings, usually 2-5 km. I also have started an introductory yoga class, which I attend once a week. I love it! In terms of meals, my current goal is to reduce the number of red meat dinners a week to 2. A good balance would be red meat X2, fish X2, vegetarian X1, and poultry X2. I would happily eat vegetarian more frequently, but Rob is very fond of meat and not that fond of vegetarian cooking. I am also aiming to cook more low meat meals (e.g., homemade turkey soup). I have added a fiber supplement to my daily diet, and am working on increasing my daily water intake by an additional eight oz. glass per day. I am on leave, so I have turned the alarm clock off. Yay! I have been getting 7 1/2 to 9 hours of sleep every night. I am making up for years of sleep deficit due to my previously hectic work schedule. I am learning to be more mellow in how I spend my days. The biggest factor of all in my more healthy lifestyle is that I am no longer working 11 hours a day in an extremely stressful job. Road to One-Eye Lake. Plein air painting completed this summer. Sometimes in life we reach a turning point, and turning sixty is one of those times for me. I have always seen life as full of possibilities, and have had a constantly evolving list of things I want to do some day (as contrasted with a list of things I have to do, which is a different story). To be fair, I have accomplished a great many things on that list. I am very good at focusing, figuring out a step by step plan, and buckling down to do the actual work. What I have not been so good at is committing to a particular line of inquiry, career plan, or workplace over the long term. Or to a particular vision of who I am and the life I want to lead. My decisions also have been shaped by a healthy dose of pragmatism. For example, from the time I was in my teens, I have always known that I wanted to have skills that would allow me to independently support myself throughout my life. So, for example, when I was seventeen, trying to decide between whether to go to art school or university, I chose university. And when I graduated with a BA in Linguistics, I then went on to further education that allowed entree into a profession where there were lots of jobs. This choice was practical, but also followed my passions for language, teaching, and communication (but backgrounded my passion for art). There are trade-offs in every decision. For every path followed, there are many paths not followed. You can never go back in time to take those other paths. Take my possible life as an artist. What would my life have looked like if I had followed that path instead? Now I will never know. At this point, you, the reader might be saying, "Oh, come on! There's nothing to stop you from throwing yourself into your art now, if that's what you really want to do. After all, that is the beauty of retirement. You are not required to work for a living once you retire, using up all your time and energy in the employ of someone else. So it is a golden opportunity to pursue those deferred passions. Or even to let go of all that anxious striving and just be." And you, dear reader, would be right. I am standing on the threshold of this period of open possibilities, looking out toward the future. After a zig into senior administration, I am now about to zag to...something else. The trouble is, I don't know what. There are so many possibilities. It is much easier to look backwards. When I look back, I can see that aside from the life changing events that fate dealt me, every major decision about a change in direction in my life or career was preceded by a period of reflection, weighing of factors, and goal setting. For better or worse, I have ended up here, author of a good life, but struggling to write the next chapter. There are so many choices! In the past, the way I responded to having to choose one direction over another was to console myself that it was only temporary -- somehow I would find a way to do it all. Maybe I wouldn't be able to do it all simultaneously, but surely I could do it all consecutively. As I have considered the possibility of leaving my career altogether and fully retiring, I have suddenly come up with a plethora of new projects that I would like to do within my career before I step away, enough exciting ideas to keep me going until I am 90! But if I go down that path, I will never find out what it is like to devote myself to my art. I will never finish writing those novels. The thing is, now that I am sixty, I realize that my time horizon is getting shorter. Choosing one thing over another has consequences, because I don't have all the time in the world. (Of course, I never did, but that was easier to ignore when my own mortality wasn't staring me in the face quite so obviously.) If I buckle down and use my remaining time to do those work projects that I am inventing for myself, Rob and I will just keep getting older and at some point we will be too old to ski that powder or hike in the Alps. I think that some day I might get to a point where I'll say, okay, enough with all these goals and this striving. This is it with trying to achieve in this area or that. This is as far as I get. And guess what -- because of never committing to any one thing but trying to do it all, I will see that I didn't do any of those things as well as I might have if I had been more focused. I hope that I will judge myself with compassion. My old self will know that life really isn't about what you do and accomplish at all. But I'm not there yet. I still have so much I want to do. However, time is getting shorter, so I have to choose wisely where to put my efforts. I have come face to face with the realization that I can't do it all, after all. That realization is having a paralyzing effect on my decision making about what comes next. Whatever choice I make feels too much like choosing to put all my eggs in one basket, too much like closing down possibilities, too much like giving up. Over the last few months, I have continued with my avid reading of FI (Financial Independence) and retirement blogs. There is a lot of great information out there in the blogosphere, and I have been impressed with the thoughtful exploration of topics, willingness to share personal stories, and the positive support bloggers provide for each other. I have learned a lot. One of the big themes is that through mindful planning and effort, both financially and personally, people can prepare for a successful and fulfilling (and possibly early) retirement. I find that people's stories really speak to me, and help me visualize my own transition to retirement. I have always been a planner. I opened an RHOSP when I was still a university student living below the poverty line. (An RHOSP was a tax sheltered savings account for saving for your first house down payment that used to be available in Canada in the late 1970's and early '80's -- okay, I know I am dating myself.) Once I graduated and got my first career-related job, one of the first things I did was open an RRSP (Registered Retirement Savings Plan). So yes, I plan. However, sometimes life is what happens while you are making other plans. I have learned that it is important to leave enough flexibility in a plan -- to not get too rigidly committed to it -- so that you can accommodate, adjust directions, and also stay open to unexpected opportunities. Here is my moose story. It happened fifteen or twenty years ago. It was Christmas time. I was living in a northern part of Canada where the winters are cold and snowy. At winter solstice, just before Christmas, the days are very short. The sun comes up around 9 and sets around 4. We were driving in my extended mini-van to go to spend Christmas with my parents, a five-hour drive on icy roads. I was tired. My job at that time always became especially frantic just before the winter break, and required long hours and intense focus. I had just finished up at work the day before. As well, I had had to do all of the shopping and other Christmas preparations, and get everything ready and packed for the trip. I was a single parent of three children aged eleven and under. Sometimes I look back at that period of my life and wonder where I found the energy. My brother had arrived the night before and was travelling with us. We also brought the cat. The van was packed with skis, boots, and poles (both downhill and cross-country sets) for the five of us, skates, winter clothes, Christmas presents, and 20-25 of my oil paintings. I was putting on an exhibition of my work at an art gallery in a small city a couple hours from my parents. So I planned to travel to that city for two days during the break, leaving the kids with my parents, and hang the exhibition and attend the gallery opening. After about four hours on the road, we stopped for gas in a little town. That was a signal to the kids to pile out of the van and race into the gas station store to buy candy and junk food with their allowance. It was also a chance for all of us to use the washroom. That brief little stop seemed to take forever. I was trying to get to our destination by 6 o'clock, as my Mom was expecting us for supper. Impatient and grumpy, I herded everyone back into the van. 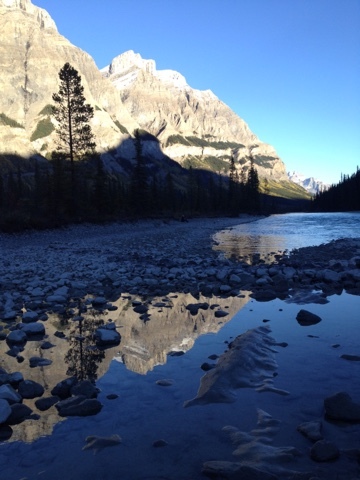 As we left the little town, and climbed up out of the river valley, the last light of the twilight had disappeared. My headlights illuminated little but the dark track of the narrow highway and the high shadowy snowbanks on either side. Suddenly, just to the left and ahead, a huge dark form exploded out of the snowbank. "Moose!" my brother shouted. It ran across the road, on a collision course with the van. Moose run very fast, and I had only a split second to respond. In that split second, I debated my options: speed up so that the moose would pass behind us? Risk slamming on my brakes on an icy road? Steer into the snowbank at highway speed? As I slammed on the brakes and steered to the right toward the snowbank, I saw the top of the moose's front legs just outside my driver's side window. The moose was so close it was within arm's length. We were all going to die. The luggage flew forward onto my children in the back seats, and the cat flew forward into the front seat. Somehow, we didn't hit the moose. Or, the moose didn't hit us. I didn't even put the van into the snowbank, but veered around the moose and back onto the road. As the moose disappeared into the darkness behind us, I found a place to pull over and sat there shaking. A fraction of a second later or a different driving maneuver, and I certainly would have been crushed by the moose. My brother and all of my children would have been killed or severely injured. My brother said that the moose had seemed to hesitate, or check its speed, just as it was about to hit the van. 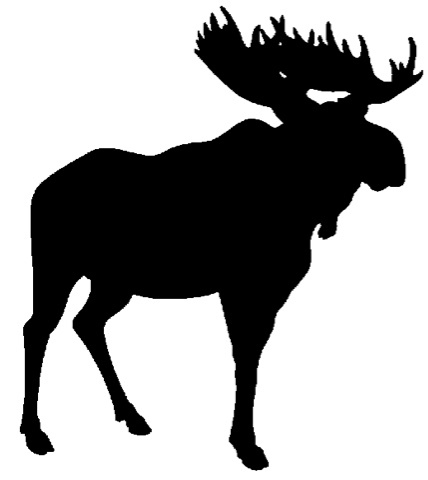 He speculated that as I turned toward the ditch, the headlights were no longer blinding the moose, and so it saw us and avoided hitting us. We could have all died. In a split second, our dinner plans, my art exhibition plans, our Christmas holiday, and the rest of my children's lives would have been forever altered. I would not be presently planning my retirement. Or, if we had left the gas station five minutes earlier or later, we might have never even seen the moose. But this isn't the end of the story. Twenty minutes later on a straight stretch, a deer suddenly appeared in front of me in the circle of headlights. It was running like crazy, from left to right in front of the van. I barely had time to brake before it disappeared into the blackness again. I may have grazed its hind end slightly with the passenger side of the van. I commented to my brother, "At least that one wouldn't have killed us all." I think I was still in shock from the near miss with the moose. I had never almost hit a deer or moose before, nor have I since. What was the chance of two near misses in one night? We arrived at my parents' place alive, had a family dinner, and made plans to go skiing the next morning, a Saturday. There was a big snowfall overnight. I headed up to the ski hill with the kids. We were all going to meet up at the ski lodge. Although the ski hill road is steep and tricky with lots of switchbacks, I had driven it dozens of times. I had studded winter tires on the van. Even though the van was a gutless wonder, I had always managed to make it up the hill. Not this time. When I got to the section of road where there is a long steep hill immediately followed by three switchbacks, I discovered a long lineup of cars stuck on the hill. I knew the van would only make it up the hill if I took a run at it. So I waited at the bottom of the hill with a line of cars behind me until the road looked clear. Then I headed up the hill. I made it to the top of the straight stretch only to discover cars ahead of me stuck on the switchback. I had to stop. The road was polished to ice from all the vehicles that had been spinning their wheels. I backed over to the side so that others could pass, and ended up with my back wheel in the ditch. At this point, one of my brothers came by in his pickup truck. "Leave the van and we'll get it out later," he said. "Jump in with us." And so we did. After all, there was some great powder waiting for us on the hill! This still isn't the end of the story. Last run of the day, and by late afternoon, it had warmed up and the foot of fresh powder was now heavy, wet, and chopped up. I was on a black diamond run, near the bottom, and for some reason I was skiing by myself. As I cranked a turn with my ancient heavy old Dynastar straight-cut racing skis, I felt my left knee tear. I knew I had seriously injured my knee. So, I sat down in the snow and waited for the safety patrol to come. I ended up being taken down the ski hill in the ski corporation van to the hospital emergency room. I had torn my medial meniscus cartilage in my left knee, and spent the rest of the Christmas holidays and half of January at work on crutches, and then used a cane for a long time. My brothers dug out the van, and brought my children down from the ski hill that day. One of my brothers drove my van full of paintings to the other town and hung the exhibition for me. It took a long time to rehabilitate my knee. Not only did I miss the ski season, but it took until September before my ability to walk was fully recovered. I could have been angry, resentful, or anxious about whether my knee would ever fully recover (the sports physio said I might need surgery, and might not be able to ski again). In previous years, I would have responded with those emotions. But this time I did not. I was at peace. I just kept thinking how fortunate we all were to be alive, and how close we had come to all being killed by colliding with the moose. My knee injury seemed completely trivial in comparison. So, back to retirement planning. Am I saying don't plan? Or that we are subject to fate, so there is no point in worrying about things? Not at all. What I took away from this experience is that it is important to plan, and to put forward your very best effort in the moment (e.g., my driving maneuver when about to hit the moose), but at the same time I recognize that I do not have full control over what happens in life. I have to be ready to accept and adjust when experiences and events do not match my plan. Last night I was reading a great blog, Our Next Life. A young couple, currently aged 39 and 41, is on the fast track to early retirement. They have done the planning and the math, and anticipate both of them being ready to retire at some point in 2017, this coming year. Wow -- I am impressed! I never could have retired in my forties. In my online retirement reading, I have found that there is a considerable community of bloggers out there writing on Personal Finance (PF) and specifically on Financial Independence (FI). They discuss how to calculate the point at which you have accumulated sufficient savings and/or non-employment income to no longer need to work for pay for the rest of your life, and strategies for getting to that point. For most people writing on the topic, achieving FI is a goal that they have set as a prerequisite for retirement. With financial independence, your time can become your own. You are no longer obligated to sell your time in order to receive money to live. A subset of younger bloggers have the objective of "Financial Independence - Retire Early" (FIRE). Many of these younger folks go to quite extraordinary lengths to establish a long stretch of future life for themselves unimpeded by the necessity of paid employment. One line of thinking is, why wait to retire until you are too old to enjoy it? Mr. and Ms. ONL are on the FIRE path, and have written about their strategies and the process particularly thoughtfully. Browsing through their blog, I came across a post entitled: What Do You Want Your Tombstone to Say? // Defining Our Purpose. They make the point that retiring early is not just about escaping from unfulfilling or overwhelming work, but rather about the rich purposeful lives that they will be able to lead when the majority of the hours of the day are no longer committed to an employer. They present some simple exercises that they did (and that you or I can do) to help define their life purposes. An interesting article I read recently related to this topic is: "Why You Wake Up Each Day" by Mike Drak and Jonathan Chevreau published in the Summer 2016 issue of Money Sense magazine (pages 27-30). In it they discuss the concept of "ikigai," a Japanese word that refers to having a sense of life purpose. They ask, "Once you have found your ikigai, why would you ever want to retire? What would you wish to retire to?" They argue that instead of working crazy hours and slaving to save for retirement, a better strategy would be to find your life purpose now, and re-balance your time and priorities to include a mix of purposeful work and increased leisure that will be sustainable throughout your life. First, a couple of quibbles and asides. Many, and perhaps most people do not have work that aligns with their life purpose (assuming they know it) in a meaningful way. Second, it is devilishly hard to balance work and leisure, especially if you do have a satisfying, rewarding job. Our current economic system is designed as all or nothing: you have a fabulous well-paid job but you are expected to work 60+ hours a week at it, or you have no job at all (or a McJob). Finally, there is something deeply discouraging, even twisted, about young people and also our knowledgeable elders being so eager to divest themselves of work. There was a time when work was a primary way for a person to contribute their knowledge, skills and labour for the benefit of their family, community, and the world. How is it that our society has turned work into mindless drudgery, or into value-conflict-ridden excessive overwork, while the things we really care about must be pursued in our ever-decreasing leisure time? Okay, now that I have that rant off my chest, my question is, what is my life purpose, my ikigai? I have to admit, that question fills me with anxiety. My gosh, I am sixty years old! Why haven't I figured out my life purpose yet? Mr. and Ms. ONL's exercises have you start by generating a list of things you like to do and would do more of if you had the time, and then you work through to identifying themes, and ultimately your key life purposes. However, I have already done that. I have lists of what I would do more of (many of which I have written about in earlier posts on this blog.) In brief, if I were retired, I would write, paint, garden, travel, pursue outdoor adventures, volunteer for causes I care about/become engaged in community initiatives, and be more present in the lives of my grandchildren. I might "keep a hand in" at work, engaging in or continuing on with certain projects that I am very interested in. That is not just one thing, a life purpose, but a whole bunch of things, none of which seem particularly earth shattering. I have tended to think of "life purpose" as something at a higher level, more significant. Long ago, I identified a "three-legged stool" that expresses my core directions and commitments: knowledge, creativity, and love. As I have revisited that stool over the years, it hasn't really changed. Perhaps I would add two more legs now, which are earth/nature, and health. I, on the other hand, am an A-type controlling controller perfectionistic over-achiever. Deep down, although I know this may sound silly, arrogant, and unrealistic, I really do feel a huge sense of responsibility for doing my part to contribute to a better world, and a sense of duty to keep at it, retired or not. Whatever "it" is (that elusive life purpose). Certainly it's not just indulging myself in painting landscapes, writing fiction, or having fun playing with my grandkids -- is it? Maybe I am thinking of life purpose in a way that is too grandiose and hierarchical. In fact, I have always had a wide range of eclectic interests and pursuits. Perhaps it is enough to have shorter term goals and pursuits that feed my brain, my heart, and my creative soul, and let the world look after itself. Maybe I need to take a page from Rob, and learn to just be (a little, from time to time). 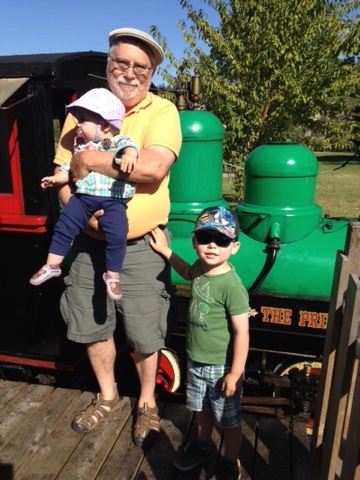 What could be better than really getting to know my grandchildren and being part of their lives as they grow up? Maybe, if I do this, when I am 95 it will all come clear in retrospect: "Aha! So that was my life purpose!" Just as long as my epitaph does not say: "She always worked really hard." We have returned from our seven week epic camper trip, and have been home for a couple of days. The last few days of travelling were focused on driving and getting home, rather than seeking out new adventures. We both felt sad that our holiday was coming to an end. We had visited friends and family, and spent lots of time in towns where we used to live. 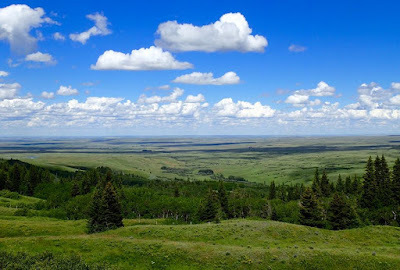 As we turned our truck east towards the prairies, it felt almost like we were leaving home rather than returning home. It was hard to say good-bye. And yet, after seven weeks of living in our tiny little house on wheels with a floor space the size of the bed of a pickup truck, we were starting to become tired of living in the camper. (I never thought I would say that; I love the camper!). Certainly, the fact that our refrigerator stopped working halfway through the trip didn't help matters. There were no more gourmet camper dinners for us as we became dependent on a cooler and ice. After awhile, the novelty of roughing it with brief camper showers and a hair wash only every second day, begins to pale. I must mention that our friends and family cooked us some wonderful dinners in those last three weeks, and we also had some great family restaurant meals, not to mention delicious fare at my women's retreat. So we didn't suffer lack of nutrition due to the broken fridge, as our waistlines will attest. Still, we both felt ambivalent about coming home. We do not have a big network of friends where we live now. Even after four years of living here, we still feel like "come-from-aways." We know that when I retire, we will be moving back to British Columbia, our home province where all of our family and many of our friends live. So we haven't tried very hard to set down roots here. In fact, our holiday felt a little bit like a fact-finding mission: would this town be a good place to move to, or this one, or this one? So when we rolled into our driveway, I was surprised at how happy I felt to be home. Our lawns looked green and lush, and our gardens were still thriving. Our house seemed huge, luxurious, and welcoming. Our pets were delighted to see us, and happy to be released from pet jail (the kennel). A big shout-out to our son, who looked after the house, yard and pets all summer, except for the first bit of September when he left for university. It was so nice to return home to a clean house, healthy gardens, and happy pets. Of course, there was the drudgery of unpacking the camper, which does not have the same fun factor as packing to go away. Doing the laundry, listening to the phone messages, dealing with a huge pile of bills and other mail, watering the gardens, mowing the lawns, as well as restocking the groceries were all immediate tasks. As happens to me every time I return from a trip, I took one look inside the refrigerator, and decided that I would not put any food into it until the fridge had a good cleaning. So we spent our first morning back emptying and cleaning every part of the fridge. I went into a frenzy of doing laundry, and Rob vacuumed and washed the kitchen floor, and mowed the lawns. I've rejoined my evening art group. We made plans to go to a concert tomorrow and invited a friend to join us. I have been to the farmers' market to stock up on organic veggies, baking, and locally raised meats. I have spent an afternoon at my office, setting out a plan for some the work that I will accomplish during this study leave. We have gone for a couple of long walks, and will do a bike ride this afternoon. It feels good to be home. As I lay naked on the table under a blanket in the attic of a former fish cannery, Sunflower, the massage therapist, assessed my body with her deft, strong hands. "I sprained my thumb on my left hand and it is still quite sore," I informed her. "And I broke the fifth metatarsal bone of my left foot last year, but now it has healed." I wanted her to know about these injury sites so that she would be gentle if necessary, and so that she could work her healing magic. "How did you sprain your thumb?" she asked. "I crashed my mountain bike," I answered, feeling sheepish. She gave a sudden laugh. "Were you riding down a mountain?" I admitted that yes, I had been riding down a steep trail, although it was more of a big hill than a mountain. Surprised, she wondered how old I was. "I am turning sixty this month." "You don't look sixty. You look much younger. Are you someone who enjoys extreme sports?" "No," I said. "But I do love all kinds of outdoor activities." We went on to talk about how I broke the bone in my foot (I stepped in a pothole and turned my ankle), and about hiking, skiing, and cycling, sports that I regularly engage in, and soccer, one that I have had to give up on because of my knees. In the course of the massage, Sunflower told me that I had strong muscular legs, and that I had beautiful feet with high arches. She asked whether I had developed the strong muscles in my arms by working out in a gym. I said that no, I had strengthened my arms by walking with crutches for four months. More recently, my arms have been exercised by carrying my grandchildren about. It was an excellent massage. I came away from it feeling very relaxed and calm. As well, I felt a sense of love for my body (my beautiful feet!). I seldom think about my body, but just take it for granted. I usually treat my body as if it is merely the vessel that carries my head around so that my brain and ears, eyes, and mouth can do the work they need to do. My experience last fall of injuring my foot and being unable to walk for so many months caused me to begin to question my neglect of and lack of respect for my body. I have begun to open up to learning ways to honour and be kind to my body. I am presently attending a women's rejuvenation retreat weekend. On the first day of the retreat, we meditated, did yoga, went for a walk in the rain, dyed silk scarves using natural plant dyes, had a cooking demonstration, and I had the massage described above. As well, we ate lovely, healthy food prepared by a calm, capable chef, and enjoyed a glass of wine or two. 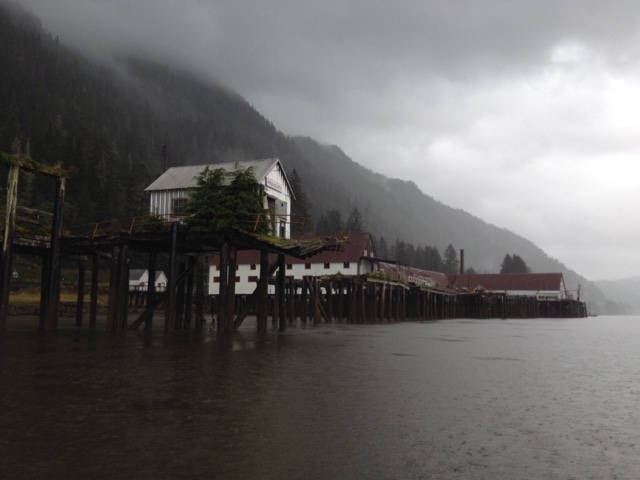 The retreat is being held at the Cassiar Cannery, near Prince Rupert, BC. There used to be many fish canneries in and near Prince Rupert and Port Edward, and at the mouth of the Skeena River. This cannery was one of the last to close, in 1983. It is a wild and beautiful place. The owners have begun to restore the old buildings, and this is the first year that they have hosted women's retreats. Last night and during the morning, there was a wild storm of wind and rain. A mudslide on the the mountain nearby has blocked the road and knocked down the power line. We now have no electricity, cell service, landline, or Internet. We ate dinner by candlelight. The train roars by on the tracks a couple of times a day. We will flag down the train and board it when the retreat ends. It is an adventure, and a wonderful opportunity to meet new friends. It is also a chance to develop a more holistic awareness and appreciation of my self in this world. Kathleen over at The Best Is Yet To Be blog* has been writing a series of posts on learning to love oneself. For me, perhaps a first step is to acknowledge the physical and spiritual aspects of myself. Those are the parts that I routinely have neglected in favour of intellectual, emotional, and creative components. I have strong legs and arms. I have a youthful body. I have beautiful feet. Sunflower says so. *As I am writing this on a tablet using battery power and a bare-bones app, with no internet access, I can't provide a link, but the blog is listed in my blog roll. We are camped at a rec site on the north shore of Francois Lake. Francois Lake is a long narrow lake lake in northwestern BC south of Highway 16 that is oriented west to east. It stretches from south of Houston to south of Fraser Lake. Coming here has reminded me of a time that my family camped here when I was a child. That memory is very vivid. We came to Francois Lake in mid to late August. My birthday is in the Fall, and I was just about to turn 8. The oldest of my brothers was just about to turn 7, my middle brother was almost 4, and my youngest brother had just turned 2. I think my parents had just bought the tent that we would use on many subsequent family summer holidays, and that this was our first use of it. It was a large green and khaki coloured canvas six-person tent. My parents had canvas cots to sleep on and we slept in cotton sleeping bags on air mattresses. I remember that the weather was chilly and damp, and we were cold at night. We camped at a fishing resort that seemed like a wonderful magical place to us. Our tent was in a large grassy area back from the lake. In front of us to the right was a stand of huge evergreens, fallen trees, and big old stumps. For us, the stumps became forts and castles, and the fallen trees a playground climbing apparatus. We soon had other children at the campsite engaged in play, gathering rocks to make pretend fire pit rings, and pine cones were the fish that we caught and cooked. Even the pit toilet holds a memory for me. On the wall of the outhouse there was a sign with a simple cartoon. It read, "Gentlemen, we aim to please. You aim too, please." In the interest of equality, there was another sign: "Ladies, please remain seated until operation is complete." I suppose even at the age of eight, I was enamoured of language as I can remember these puns more than fifty years later. While we were at the resort, my Dad rented a boat and we went out for a day of fishing. We trolled two lines from the boat, from my Dad's rod and a second rod that we children took turns with. I was always lucky fishing as a child, and I remember that I caught two or three fish, one quite large. Of course, what really happened was that when I got a bite, my Dad probably took the rod from me and played the fish and brought it in. My oldest brother was aggrieved that I was catching fish and he had not, so demanded an extra long turn, which I deeply resented. While we were fishing, my middle brother had to pee. We were a long way from shore, and my Dad did not want to go to shore, and in any case, there was no easy place to beach the boat. So he told my brother to pee over the side of the boat. He was horrified at the idea and refused. He was then convinced to pee into a pink melamine cup that Mom provided out of the picnic supplies. That cup remained in the picnic supplies for years, and even though it had been scalded and scrubbed in soapy water, I always refused to drink out of that cup. At lunch time, we beached on an island that we "discovered." It was a steep-sided island with lots of trees, but it had a gravel beach in a little cove that was covered with agates. There were also gulls wheeling and screeching overhead, hoping for fish and picnic leftovers, I guess. I imagined that we were the first to have discovered the island, and like explorers, I thought we should name it. There was a great debate, with some members of the family wanting to name it "Gull Island" and others wanting to name it "Agate Island." In the end, we settled on "Gull Agate Island." Fifty years later, I am still searching for agates on every gravel beach. Our new sweatshirts are another vivid memory about that trip. When we first arrived at the resort, my parents presented each of us with a new sweatshirt. Our family was not well to do at that time, so getting new clothes was something very special. My oldest brother and I each received a grey cotton sweatshirt with a hood. It was my first "hoodie." They were much too big for us and the sleeves had to be rolled up multiple times. My middle brother received a red hooded sweatshirt, and my baby brother a white one. Later in October, those sweatshirts served double duty as Halloween costumes. With the addition of masks and tails, my brother and I wore our grey sweatshirts with hoods and were cats. My middle brother had red face paint, horns, and a tail and was a devil. My little brother had floppy ears, a pink nose, and a cotton ball tail, and was a bunny rabbit. Before supper on Halloween, We put him in the wagon and pulled him around to a few house nearby to trick or treat. He made a very cute bunny. Yesterday afternoon, we came to the same resort which is still there, thinking we might camp there. As we started to pull into the access road, I could see that it was nothing like the place I remember from childhood. The trailers and RVs were packed in like sardines, so we decided not to stay. Instead we camped at a rec site a little ways down the road. Last night we watched a golden eagle eating his dinner in a tree beside our campsite and then we sat at a picnic table and watched the sunset as the waves rolled in. One of the frustrating things about where we live right now is that we are far away from our kids and grandkids. Between the two of us, we have five kids, Rob's daughter and son, and my two daughters and son. All five of them are adults now, and they all live in various parts of British Columbia. We are also fortunate to have four grandchildren, two little boys from my eldest daughter and husband, and a little boy and girl from Rob's daughter and her husband. The grandchildren are all close in age, ranging from 15 months to 4 years old. From where we live, it is a 2 to 3 day trip by car to visit any of them. Flying is expensive, and usually requires 2 or 3 connections. We have been further hindered by my crazy work schedule. We have managed to visit each set of grandchildren a few times each year, but often the visits have been quite short. We feel that we never have enough time with them. So one of the important goals of our epic camper trip was to visit the kids, grandkids, and other family and friends. We spent a few days in Prince George after the ArtsWells Festival, and both families of grandchildren were there, and we all got together for dinner. The kids had a wonderful time playing. Then following our trip to Bella Coola, we made our way back to Prince George, and spent a week there with Rob's daughter and her family. In fact, as their daycare was closed for summer break, we looked after the two children while their parents were at work that week. It was a wonderful chance to spend some time with the kids and really get to know them. It was also a chance to do some grandparent-type things with the kids. Every day we went on an excursion. We went to the water park, to various playgrounds, and for a ride on the miniature railway. We had ice cream and stories and cuddles. 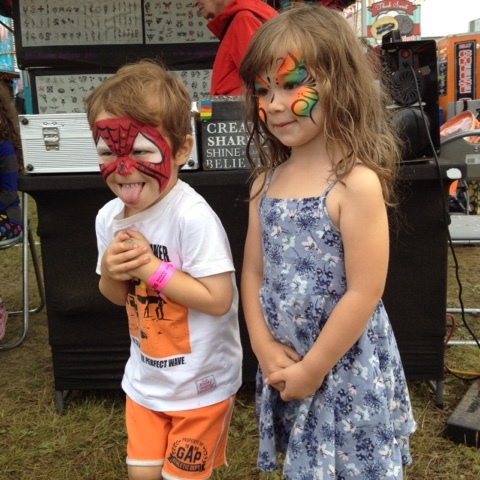 On the weekend, we went with the kids and their parents to the fair, and took a million pictures of our grandson going on the rides, fishing for prizes, and racing through the obstacle course/climbing apparatus over and over again. We felt so lucky to have had this time with the grandkids and also a good visit with Rob's daughter and our son in law. We were sad to leave. We are now heading further west to visit my Mom and some other family members. My daughter is going to fly in with her two kids, so soon we will have another visit with our other set of grandchildren. We are so happy to be grandparents! This week in Prince George has given me some insight into what the grandparenting role might be like if we lived close-by. It also has given me a little kick in the pants in the direction of retiring. After all, kids grow up fast. One dilemma is where to relocate to. Our four oldest grown kids each live in a different city, and the youngest is still moving around, having decided to go back to school this fall. We can't live in four places at once. If we decide to settle near one set of grandchildren or the other, there is no guarantee that they will stay in that community, as both couples have busy careers that could take them elsewhere. So we will need to choose a place that we will be happy in over the long term, whatever our kids do. But one thing for sure is that once I have retired, I will have lots more time. We can travel to visit the grandkids more often and stay longer. If we settle just about anywhere in BC, we will be closer to all the kids, grandkids, and other family and friends. I grew up in northern British Columbia in a village that incorporated to become a small town when I was a child. My father's family moved to the valley in the early 1900's and homesteaded and farmed. Our family was one of the first settler families in the area. 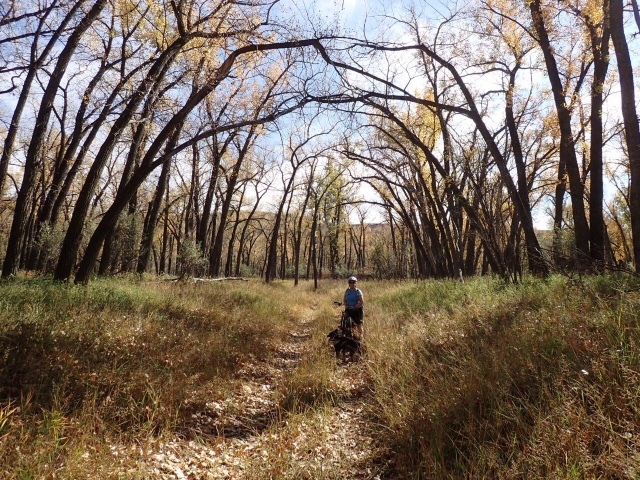 Although our little town had all the amenities -- a paved Main Street, power, water, and sewer, and even one television channel beginning in 1963, a pioneer lifestyle still was the norm in much of the surrounding wilderness area. During the 60's and 70's, many young people from across Canada and the United States were attracted to the area because of the chance to live a back-to-the land lifestyle, and they brought cultural richness in the form of diverse ideas, music, and the visual arts. Many have remained in the area and raised their families. When I was growing up, we did lots of hiking, skiing, and exploring old back roads as a family. We also gathered the riches of the land. For example, in the Fall, we picked huckleberries and blueberries, which my Mom canned or froze. My parents had a large vegetable garden, berry bushes, and fruit trees. In my younger years, my father hunted for moose, deer, and grouse. My Dad made wine out of native plants, such as choke cherries and dandelions. A typical Sunday afternoon activity for the family in the Fall was cruising the back roads with a 22 rifle or a shotgun, looking to get a couple of grouse for dinner. And, of course, we went fishing. My Dad was an avid fly fisherman, and one of my earliest memories is of picnicking at Driftwood Creek and hunting for fossils while my Dad fished the creek for rainbow and cut throat trout. As he was a skilled fly fisher, we often came home with trout for dinner. We also fished for salmon, steelhead, and Dolly Varden in the rivers, and rainbow trout, lake trout, and Kokanee in the many lakes in the area. My Dad (who was not a naturally patient man) took the time to teach my three brothers and me how to fish, although as we had to take turns with the rod, it never seemed to me that I had enough fishing time. When I grew up and went to the city for university, and then later married and lived in one city after another, I missed the hiking and skiing that I had grown up with, so I strived to make opportunities for these two pastimes that I loved. However, I hadn't realized that I would also miss the gathering and eating of wild foods, and that I would miss fishing so much. These were two things that I seldom had the opportunity to do. After my first husband passed away, I raised my three children as a single mom for many years. During visits to my childhood home, my Dad and my brothers sometimes took my kids (and especially my youngest son) fishing. When I moved back to northwestern BC, my dear friends sometimes included us on fishing trips, and one of my closest friends, who is a renowned fly fisherman offered my son and me some fishing instruction. Fly fishing is not a skill that can be picked up after a few tries. It is something that takes years of dedication and practice to master. I did not have my own fishing equipment or the time to practice. But I still yearned to fish. My friends and family surprised me with a big birthday party when I turned 50, and gave me waders, wading boots, and a fishing rod. I few years later when I met and married my second husband, who loves to fish, he took me under his wing, and began teaching me both how to spin cast for salmon and dollies in the rivers, and how to fly fish. I absolutely love fishing, especially fly fishing (even though I am still not good at it at all). There is something so peaceful about standing out in a wild river casting the fly line and sometimes catching one. 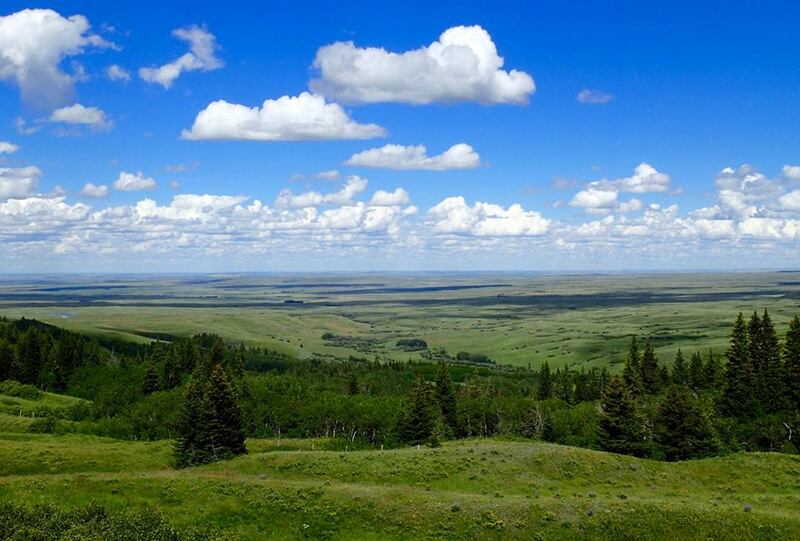 However, for the last four years, we have been living on the prairies, far away from any good fishing rivers. The few rivers closest to us are so crowded with fishermen that it does not seem sporting at all. 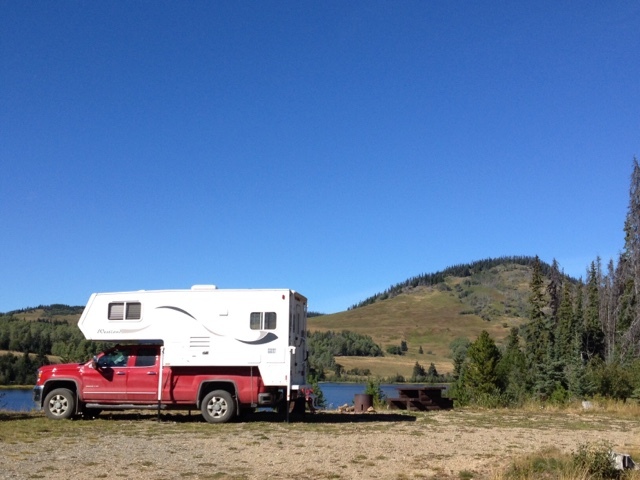 We presently are on a camping trip in the West Chilcotin area of British Columbia. 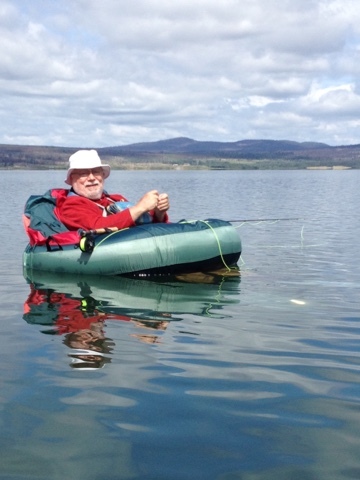 We spent three days at a great little fishing lake, and went out fishing in our belly boats every day. We have been fly fishing: dry fly, wet fly, and sink tip. Two days ago, Rob caught a twelve inch rainbow trout, and we fried it up for lunch and ate it with the potato salad I had made the day before. It was delectable! Finally, yesterday, I managed to actually land a fish that I hooked. I had just started to feel quite discouraged, then I managed to catch a beautiful twelve-inch rainbow trout. I caught another small one and released it. I hooked another good sized one and brought it up to the boat then lost it. Meanwhile, Rob caught and kept four smaller pansized rainbows. (He also caught and released several). So we had another amazing feast of rainbow trout. It has been many years since I have eaten trout. (I refuse to buy the dull, sad looking fish that the grocery store sells as "fresh trout.") The rainbow trout was delicious, and it took me right back to my childhood, fishing with my family. This has truly been a wonderful holiday. 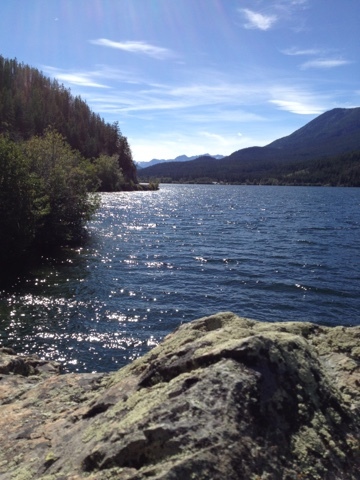 We are presently camped at a beautiful little lake, the name of which must remain unwritten, as Rob is certain that if I mention it on my blog, hoards of people will suddenly descend on this remote location in the West Chilcotin area of British Columbia. We are staying at a BC Recreation Site. There are four campsites at this rec site, and each one is large, open, private, and with easy access to the lake. Each one has a picnic table and a fire pit, and there is a relatively clean pit toilet. We discovered "Nameless Lake" on our way to Bella Coola. We arrived in mid-afternoon and found that we were the only ones at the rec site. The lake was glassy calm, and there were fish rising and jumping in every direction. We quickly set up the camper, and then got ready for fishing: sunscreen, bug dope, hats, inner layer, waders, fishing rods and flies, fins, and belly boats. Soon we were out in the lake fishing and it was lovely. There is an island about three hundred meters out across from the rec site, and another smaller island to the east. At first we both fished just offshore in front of the rec site. I was fly fishing with a sinking tip with a timberline emerger, and casting, trolling a bit, and then casting again. As I gained confidence with the boat, I began to make my way towards a narrows between a point and the western tip of the island. I was drawn to that location because I could see a lot of fish rising there. Sure enough, I began getting bites. I hooked an 8-9 inch (est.) but lost it. Then I caught a bigger one, and played it up to the side of the belly boat. It was big enough to keep, and I suddenly realized that I didn't know how to land it in the belly boat, and also I had nothing to bonk it with. As I messed around with my rod and the line, the fish managed to shake itself off. While all this was going on, some big clouds were forming in the west. I noticed them, and started to slowly fish my way back across the lake toward the rec site. All of a sudden, a brisk wind came up, blowing from west to east. Waves were slapping against the boat. I quickly reeled in and began to kick my way across the lake as fast as I could. I hadn't realized how far I had gone. Belly boats do not move very fast, and I got a real workout trying to cut diagonally across the wind. I was worried that I would be blown onto the island and not be able to get back across the lake. I was also worried that the wind would blow up into a thunder and lightening storm, in which case it would be very dangerous to be out on the water. Sensible Rob was fishing near shore, just west of the rec site. He called to me to come back across, not able to see by my slow progress that I was giving it all my effort. I did manage to make it across the lake to shore. By the time we beached our boats, there were whitecaps on the crests of the waves, and the waves were pounding on the shore. We tied our belly boats to a tree so they wouldn't blow away. Later during dinner, we saw lightening strikes in the distance, and in the night there was a huge thunder and lightening storm. It was still raining in the morning, so we moved on. We are now on the return trip from Bella Coola, and have come back to Nameless Lake. A couple from Courtenay that we had met at another campsite a few nights ago is camped at the site one over from us. A young couple with a van and a blue tarp stretched out over their table is camped on a huge grassy spot beside the lake. They have set up a camera on a tripod to take pictures of the meteor showers that are supposed to happen tonight. And a person with a BC government truck is camped in the fourth site. We fished in the belly boats when we arrived yesterday evening, and again this morning. Today was a gloriously sunny day. The fish were biting this morning. I had many strikes, and reeled in three. One I released, and the other two shook themselves off as I brought them up to the boat. I am still not sure how to actually land one. 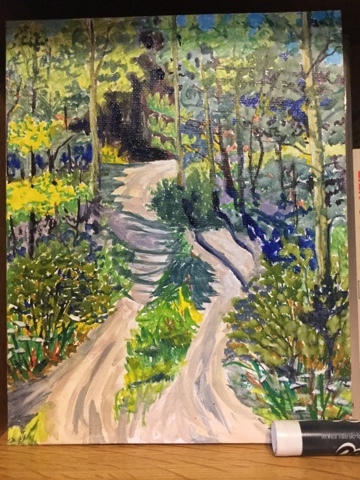 This afternoon, I set up my easel and painted a small plein air scene of trees with long shadows and the little rutted track winding down to the rec site. Meanwhile, Rob chopped some firewood and then went out fishing again, but it was quite windy and not very pleasant. We had a bonfire this evening and roasted weiners. Also, I made potato salad. A fine evening, which concluded with a hair wash and shower. Oh, the luxury of the camper. If Rob had his druthers, we would stay here for weeks! At the end of July, we set off on an epic camping trip across northern British Columbia. We have a pickup truck with a camper on the back. I call it "epic" because we are going to be on the road for seven weeks, staying in the camper. Much of that time we will be in places that have no Internet service. I love our camper. It is a very cozy little home on wheels. Although space is limited (how much can you fit in the bed of a pickup truck? ), there still seems to be room for everything we need. We have a comfortable bed, clothes, dishes, food, and a small bathroom with a shower. The camper has a furnace to take the chill off on cold nights (it is a three season camper). On this trip we have brought along with us fishing equipment, my plein air painting supplies, some books, cameras, iPads, crib board, and our mountain bikes. Our first destination was the ArtsWells Festival in Wells, BC. Wells is a tiny village (population 250) in the interior of BC, east of Quesnel. This area was settled in the late 1800's during the gold rush. There are still mining claims in the area that are being actively worked. Nearby Barkerville has been restored and is a popular tourist destination. Fifty years ago, Wells nearly became a ghost town. However, a number of artists moved into the community and restored many of the old buildings. They lobbied to keep the school open. Wells is now the home of Island Mountain Arts. As well as the four-day ArtsWells Festival on the August long weekend, which is mostly music, but also theatre, literary events, and visual arts, the community also hosts visual and performing arts workshops and courses throughout the year. Some of my favourite music events of the weekend were Ken Hamm, Aurora Jane, Carole Pope, Coco Love Alcorn, Jenny Ritter, Kym Gouchie, Scarlett Jane, and Quique Escamilla. We had a great camping spot behind the Jack O' Clubs Pub, near the river. One of the days that we were there, we rode our bikes to Barkerville and had lunch and spent the afternoon there (and took in a Ken Hamm concert in the Methodist church), then rode back. 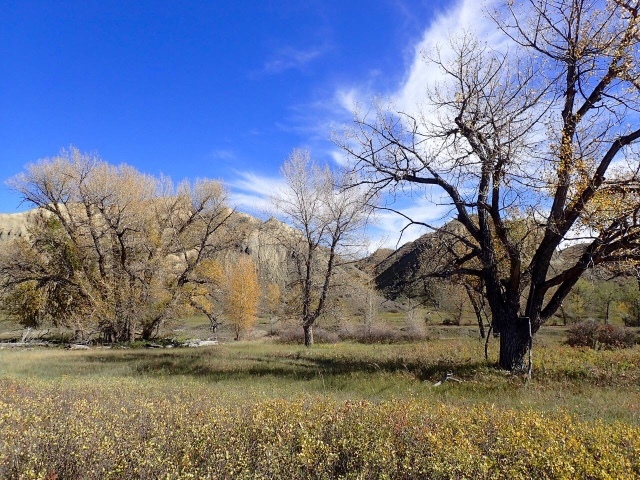 Another morning, we hiked some of the trails along the Willow River and Williams Creek. As the whole area has been so extensively mined, these watercourses, Jack O' Clubs Lake, and the village of Wells itself are built upon and surrounded by old mine tailings. We also went and visited with Claire Kujundzic and Bill Horne, two of our favourite artists who run the Amazing Space art studio and gallery. And what does all this have to do with belly boats? 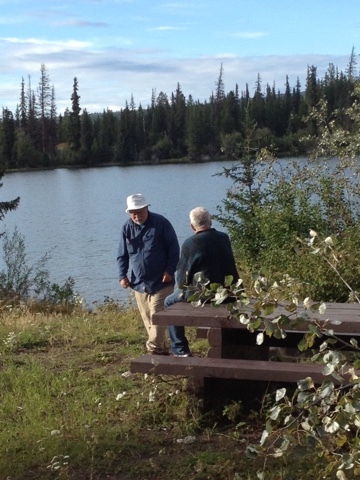 Well, as we were travelling over the Interlakes highway between Little Fort and 100 Mile House, we camped one night at a little fishing lake. This whole area is a world class fishing destination. We, however, are only set up for fly fishing in rivers, not for lake fishing. So we stood on the shore looking out at the pretty little lake, and watched the fish jumping and rising in every direction. We knew that later in our trip we would be travelling through another area with many fishing lakes. So, when we pulled into 100 Mile House, we went to a fishing store and bought ourselves early birthday presents. Belly boats. 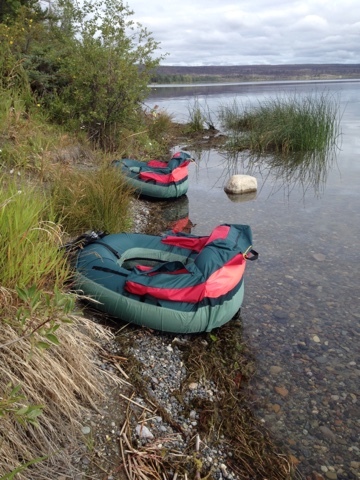 These are essentially inflated truck inner tubes for fishermen to sit in while floating out in lakes. They wear waders with flippers on their feet to propel themselves through the water. Yesterday we got to try out our belly boats. We are at Puntzi Lake, a famous fishing lake along the route to Bella Coola. What fun! It was lovely to be out in the lake with the loons and the gulls. Apparently the rare white pelican is nesting at this lake this year, so maybe we will see one. We got a couple of bites, but didn't catch anything. When it started to rain, we finished up and went back to our campsite and had dinner. There was a tremendous thunder and lightening storm in the evening, but we were warm and cozy in our camper.